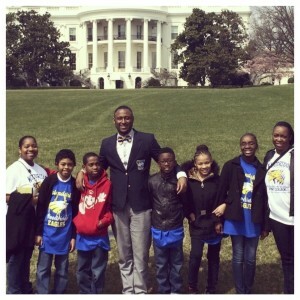 For Rictor Craig Jr., principal at Woodridge Elementary and Middle School in D.C., going to school was never a drag. He knew early on that both giving and receiving an education would be major passions of his. He knew so much so, that he began taking college courses in the 11th grade. Rictor holds a B.A in Professional English from North Carolina A&T State University, a M.A.T from Morgan State University, and a Masters of Science in Administration from Trinity Washington University. Rictor attributes his love of learning to his parents, who didn’t have the same opportunities as him when it came to education. For Craig, encouraging and overseeing students, similarly to how his parents did for him, are important in guaranteeing quality education and a hope for a better future, especially for minorities. Friendship Woodridge is a PreK3-8th grade campus that serves 500 students in Northeast Washington D.C. The mission of Friendship Woodridge is to develop inquiring, knowledgeable, and caring life-long learners who actively contribute to their global communities through inter-cultural understanding and respect.